Little different than last time, but overall a good stay. Room tip: Ask for an updated room around this time. The hotel is definitely older and the rooms show wear. However, it is in a good location, was very clean, and had fairly comfortable beds. You can't see the beach from the rooms, but it is accessible by a small boardwalk that is an easy 200 yard walk. Thank you for choosing us for your recent trip. It has been our pleasure having your business. Very good location if you want to walk to the beach. The room needs some updates mainly the bathrooms. The bed is very comfortable and the room has a microwave and mini fridge. The bathroom is old and our toilet never work unless we manually stuck our hand in the back tank. They do not have onsite maintenance. Housekeeping would not come to your room unless you called daily. It was inconvenient to come to your room at four in the afternoon and have no towels. Several guests on same room had same complaint. One had no working TV or phone and no lock on patio. Breakfast starts at seven and that is a bit late. The front desk locks you out of the lobby in the morning until breakfast is ready. I feel that if the bathrooms were updated and management was able to improve skills of housekeeping and overall operations it would be an awesome place to stay. If you want to be near the beach and don't care about thrills this would be a great place. It's also walking distance to shops, grocery stores and several places to eat. We are pleased you chose us for your recent visit. Thank you for your business. My experience at quality inn and suites was much better than I expected. 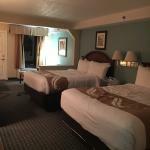 When I checked in I was very impressed with the great service we got at the front desk. The man that helped us was very pleasant and helpful even considering it was 12:30 at night. 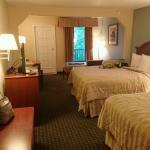 The room was very nice, I think at quality inn you get the most bang for your buck. We love having you as our guest. Thank you for your business. We hope to see you again soon. MY wife and me stayed the weekend and My parents stayed the week.The beds were clean and very comfortable. WiFi was good.The refrigerator and microwave worked but they need updated. When we checked out new pillows were put in whole hotel. My parents said they were real nice, the ones taken out were not that bad. The view of the ocean can be seen from the 4th floor balcony just not very well and no beach view but the boardwalk will take you to the beach and good location for about every thing else.They are in process of updating facility just need a few finishing touches. We are happy you enjoyed your stay and will return. Thank you for being our guest.